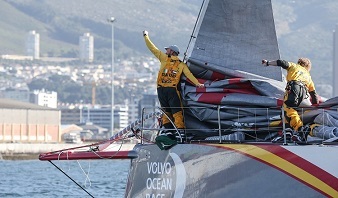 The Volvo Ocean Race 2014-15, a 38,739 nautical mile race around the world with stopovers in 10 ports, started October 11 in Alicante, Spain. Abu Dhabi Ocean Racing won the 6,487nm Leg 1 to Cape Town last week (November 5-7, 2014 finishes). The boats will now be given a maintenance check and the crews a breather before the fleet sets forth for the second leg to Abu Dhabi on November 19, 2014.
each of the seven teams throughout the day. 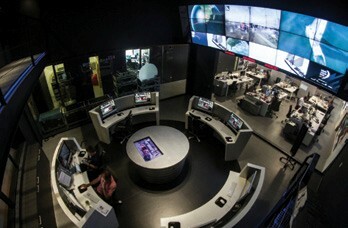 Inside the Volvo Ocean Race Headquarters in Alicante is a Race Control room that looks straight out of a NASA control center. While boats are on the water, it is staffed 24 hours per day. We caught up with Infante just before the start. WindCheck: What goes on in Race Control, and what is the primary function of your team? Gonzalo Infante: Main function is safety. Looking after safety of the fleet which means providing as much information to the outside world on what is going on. To achieve that, we have really advanced telemetry systems that work with satellite networks set up by Inmarsat. We can monitor performance, structural stress, and environmental information with frequency up to 10 seconds. Any sort of data you can think of. WC: Who else is in the Race Control room with you? 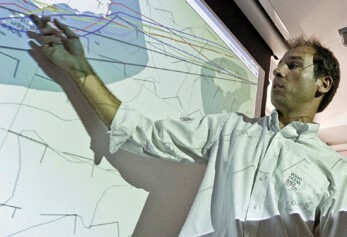 so everyone can be updated to the moves the boats are making, the strategic decisions and types of sailing. WC: How are media, communications and weather information sent back and forth between Race Control and the boats? GI: Every bit of information that is transmitted is possible from the Inmarsat network and the Cobham hardware that is installed on board. It’s a high-bandwidth transmission through a constellation of satellites. We have two different systems on board that can give you an output or 500MB or 250MB per second, which is faster even then the Internet you would have had 10 years ago in your house. This is incredible speed to have on a boat in the middle of nowhere thousands of miles from land. We have a system on-board that we designed in-house that manages the communication of this traffic efficiently. For example, videos come off the boat, get reviewed and then go directly into folders for teams, media and PR purposes. WC: Due to the race aspect, communications for boats is limited, right? GI: Yes, absolutely, the teams don’t have free access to the Internet. Even if we have the most sophisticated sat comms on board, the traffic to/from is restricted to Race Control to create and maintain a level playing field. No one gets a competitive advantage from communications. All of the teams receive exactly the same weather package from Race Control, and cannot communicate externally without prior consent of Race Control and copying the Race Headquarters. WC: What information do you send in the daily weather data, and when do you send it? GI: We have a very, very big package with the best possible information available worldwide that includes weather models, satellite observations, various measurements from ships, airports, oceanic currents and text written forecasts. We send this information through when the different products are available to us, so it depends when these products provide their data feeds throughout the day. Then it gets sent on. 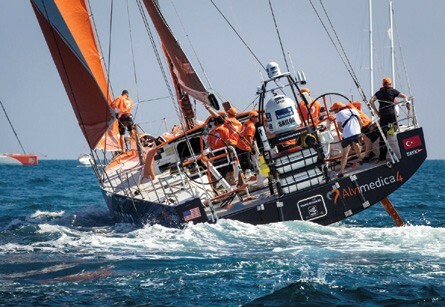 The seven Volvo Ocean 65s are tracked 24/7 via the Inmarsat satellite network, and each has sat comm equipment identical to that shown here on Alvimedica. Rhode Island’s home team, Team Alvimedica won the very first event in the Volvo Ocean Race 2014-15, the In-Port Race in Alicante, on October 4. WC: What is your background as a sailor, and have you ever sailed on the New England coast? GI: I’m a Grand Prix sailor. I’m still on the water over 50 days per year, so that keeps my sailing acumen and also I can continue to understand how the weather impacts sailing. My latest racing has been in the TP52 with a tactician from Rhode Island named Tony Rey, so I have a local connection there with you. I’ve sailed with the Open 60s in the New York area, as well. In 2010, we set the offshore record from New York to Barcelona, so I have great memories sailing in that area. WC: What kind of tricky things can happen off the New England coast on the legs to and from Newport, Rhode Island? GI: The main factor for me is the water temperature – well, the Gulf Stream – because the Gulf Stream causes very fast-changing conditions and spring is always a transition and we have a lot of activity from the polar fronts. This, together with the warm waters of the Gulf Stream, can always create interesting scenarios. For Volvo Ocean Race articles, updates, twitter feeds, team info and Newport stopover news, visit WindCheck’s Volvo Ocean Race website.